MANILA, Philippines - It's been close to two years since boy band 2PM released their last Korean album in 2011 and they said they're currently working to finish a new album, telling fans to be prepared to be blown away. 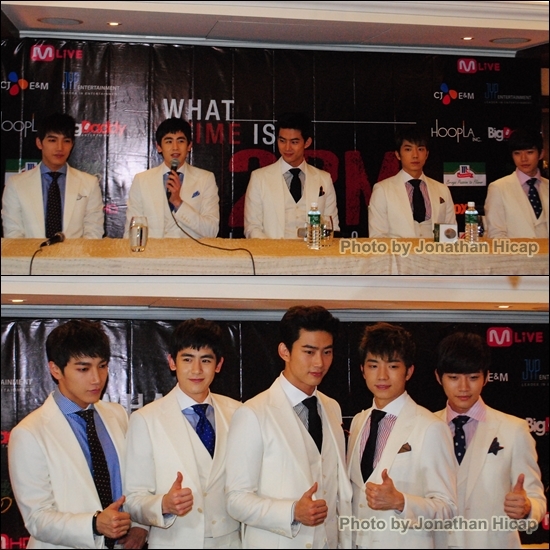 2PM revealed this and more when they held the press conference recently at the historic Manila Hotel for their first ever Philippine concert “What time is it” Live Tour 2013 held Saturday at the Mall of Asia Arena. Since 2011, 2PM has focused on the Japanese music market and their first Asia tour. Their hard work paid off when their latest Japanese album "Legend of 2PM" topped Japan's Oricon, HMV and Tower Records charts. "It's our second album in Japan. It's called the 'Legend of 2PM.' We've launched it and we actually got the first place on the Oricon chart. It's a very prestigious chart. It's our first time getting the first place. We are very glad and thankful. The reviews and fans' response are very good," 2PM said. Fans are clamoring for 2PM's new Korean album and the boy band said it would be entirely different from the last one. "We still have our upcoming Korean album to be released very soon. Be prepared for your mind to be blown," they promised. After the presscon, Manila Bulletin and five other media outlets held an exclusive interview with 2PM where the boys answered personal questions, revealed plans for the future and talked about the Philippines. I asked 2PM if their promoting in the Japanese market and doing their Asia tour were part of the group's long-term career plan to go beyond Korea. Taecyeon said it's always been their dream to perform in other countries. "I'll say not everything is according to plan. You know how situations can change every time. We always dreamed about moving to some other countries and actually doing performances. We started our Asian tour last year. This is our second Asian tour. It's started way before then. Focusing on the Japanese market and Korean market, as far as we see it, we're expanding our horizon so that not just Asia but maybe Europe, maybe America. If there's a chance or possibility that we can succeed in some other continents then we'll be running right towards where the stages are," he revealed. When 2PM debuted in 2008, they were described as "Beastly Idol." Do they consider themselves as Beastly Idol until now? "'Beastly Idol' was given to us by our fans, so we love it. I think the fans gave us the name because of stage concepts, acrobatic performances and the fact that we like to work out. But we are more 'gentle' rather than a 'beast' in real," they said. During the exclusive session with 2PM, Nichkhun said they will keep their image as "Beastly Idol." "It's been really hard because people expect us to [remove] our shirts and stuff. We have to keep in shape all the time. It's kinda pressuring a little bit but, I mean, we're the only group in the industry that has this name, the Beastly Idol. We're really honored to have this title. We're gonna keep it and we're gonna work hard to keep it. We're gonna stay firm and fit," he said. On what types of songs will be included in the new Korean album and if the members will write songs for the album. "Most of us are singer-songwriters actually right now. We're actually preparing. We're gathering the songs and from the looks of it, it's gonna be dynamic, different from before. It seems like we have upgraded our levels as not just idols but more like matured men, artists. It's gonna be somewhat [have a] different feel from what we usually gave before. It's gonna be easy to understand, we'll gonna get right to the point where it's like [when] you hear it, you exactly know 'Oh, this song is good.' [The album will be released] soon," said Taecyeon. When asked what's the first thing he did or wanted to do when 2PM arrived in Manila, Nichkhun said he wanted to try the street food and see what "balut" looks like. "Balut" is a famous Filipino food, which is a boiled fertilized duck egg. "I like to walk the streets of Manila and eat the street food. I'd really like to see what 'balut' really looks like. I don't know if I can eat it. I heard it's really good for you," Nichkhun said. Jun.K said he wants to try "halo-halo," a Filipino dessert of shaved ice, evaporated milk and boiled fruits. It is similar to South Korea's "patbingsu." With their busy schedule, 2PM said they had only one official holiday to date. They usually meet their families if they're not working. "Sometimes we do have no time to sleep. So when we have time, we usually go meet our family and sleep at home. There was only one official holiday for 2PM until now. We all did what we wanted such as traveling, spend time with family. Junho went to Africa as volunteer during holiday to spend some quality time. We were very proud of Junho and were touched by his experience," 2PM told Bulletin Entertainment. When asked which part of Korea they would recommend to fans to visit, Jun.K said Daegu (his hometown); Wooyoung said Busan (his hometown); Junho replied Everland Resort (Korea's largest theme park); Nichkhun said Jeju Island; and Taecyeon said Namsan Tower, or N. Seoul Tower, in Seoul. Top 3 items that 2PM members carry in their bag all the time: Jun.K - wallet, earphone, pen; Wooyoung - laptop, pencils; Junho - tablet, vitamins; Nichkhun: picture of his family, first-aid kit and candies; and Taecyeon: tablet PC, wallet and contact lenses. Jun.K and Wooyoung tried to speak in Filipino when the members were asked to say their messages to fans. Jun.K said, "Mahal ko Filipinos. Mahal ko Philippines." Nichkhun said it was their second time to visit and he apologized to 2PM fans in the Philippines that their plan to visit the country took so long. "This is my second time in the Philippines and [it's] really great to be back. I'd like to say sorry, first, to the Hottests for taking so long to be here...Thank you guys for always waiting and loving us. Thank you," he said.